علی الحسابی, مهران, چربگو, نصیبه, رضازاده, راضیه. (1396). ارایه مدل مفهومی معنای مکان و شاخص‌های تداوم آن (تحلیل پدیدارشناسانه تفسیری تجربیات زیسته افراد). ماهنامه علمی پژوهشی باغ نظر, 14(52), 17-26. مهران علی الحسابی; نصیبه چربگو; راضیه رضازاده. "ارایه مدل مفهومی معنای مکان و شاخص‌های تداوم آن (تحلیل پدیدارشناسانه تفسیری تجربیات زیسته افراد)". ماهنامه علمی پژوهشی باغ نظر, 14, 52, 1396, 17-26. علی الحسابی, مهران, چربگو, نصیبه, رضازاده, راضیه. (1396). 'ارایه مدل مفهومی معنای مکان و شاخص‌های تداوم آن (تحلیل پدیدارشناسانه تفسیری تجربیات زیسته افراد)', ماهنامه علمی پژوهشی باغ نظر, 14(52), pp. 17-26. علی الحسابی, مهران, چربگو, نصیبه, رضازاده, راضیه. ارایه مدل مفهومی معنای مکان و شاخص‌های تداوم آن (تحلیل پدیدارشناسانه تفسیری تجربیات زیسته افراد). ماهنامه علمی پژوهشی باغ نظر, 1396; 14(52): 17-26. هر عصری هویت خود را دارد، اما آنجا که گسست روی می‌دهد بحران رخ می‌نماید. به‌نظر می‌رسد تجلی و تداوم معنا در محیط، راه حل پاسخ به بحران عدم بازیابی خود در شهرها در عصر امروز است. بنابراین، امروزه پرداختن به این سؤال ضروری به نظر می‌رسد که در شرایط تغییرات گسترده در شهرها، ادراک تداوم معنا به واسطه کدام مؤلفه‌ها و با چه اولویت‌هایی ممکن می‌شود؟ به عبارتی، این نوشتار به دنبال پاسخگویی به بحران گسست معنا در محیط، چارچوب مفهومی معنای مکان و شاخص‌های تداوم آن را ارایه داده است که می‌تواند راهنمایی در اولویت‌های معنای مکان و جریان پیوسته آن باشد. به این منظور، ابتدا ادبیات مرتبط با مکان، معنای مکان و یکی از مهم‌ترین اصول حاکم بر معنای مکان یعنی تداوم مرور شده، سپس چارچوب مفهومی پژوهش تبیین ‌شده است. در چارچوب مفهومی، ضمن ارایه مدل مفهومی برگزیده از معنای مکان، شاخص‌های اولیه تداوم معنا نیز ارایه شد که تکمیل و تدقیق آنها در ادامة پژوهش میدانی مد نظر بوده است. روش این پژوهش در تبیین و تکمیل شاخص‌های تداوم معنا، روش کیفی است. رویکرد منتخب در مطالعه معنا، نشانه‌شناسی با دورنمایی از پدیدارشناسی است که به مرور تجربیات زیسته افراد می‌پردازد. با توجه به این موارد، در بخش تحلیل نیز رویکرد پدیدارشناسی تفسیری مد نظر بوده است. در پایان با توجه به هدف تحقیق که دستیابی به شاخص‌های تداوم معنا در مکان است، جمع‌بندی از یافته‌ها صورت گرفته است. یافته‌ها حاکی از آن است که تداوم یک پدیده منوط به حضور همزمان دو کیفیت پویایی و ثبات در آن پدیده است. به عبارتی ثبات در جایگاه و روابط بین اجزاء و پویایی در خود اجزاء پدیده مورد نظر در ادراک تداوم واجد اهمیت است. به علاوه، در تداوم معنای مکان ثبات روابط بین اجزا و مؤلفه‌های مکان از اهمیت بیشتری نسبت به ثبات اجزاء مکان برخوردارند. همچنین تحلیل دقیق تجربیات زیسته نشان داد، در روابط بین اجزاء مکان نیز رابطه دو جزء انسان و فضا واجد بیشترین اشاره‌های معنایی و ماندگاری ذهنی بوده است. Todays, the emergence and continuity of place meaning is significant in response to identity crisis. Additionally, it is clear that when a breakup occurred in the continuous flow of identity, a crisis appears, which is the focus point of this article. For this, the authors presented a conceptual framework for place meaning and indexes for its continuity, which could be a helpful guide in determining the priorities and continuity of place meaning. Considering this topic is really important as there is a large amount of literature on the meaning of place and its elements but there is not much on the continuity. On the other hand, regarding vast changes taken place in the Central part of Mashhad city, searching for the perception of continuity is essential. So, first of all, literature of place, place meaning and continuity as one of its major principles have been reviewed. Then our position in this amount of literature has been modified in the form of conceptual framework. In the conceptual framework a new conceptual triple model has been presented for place, which consisted of three components of space, time and human. In the proposed model, the meaning of place is considered as relations between these components. In addition, the concept of continuity as a principle governing place meaning is placed at the middle of the model. The primary criteria of continuity have also been described in this part. The concept of continuity has dynamics and stability in itself, simultaneously. These two are major dimensions of this concept. Stability in component’s relation and dynamic in the components themselves are different aspects of these two dimensions. Indeed, relations expected to be series of psychological generalities perceived through mental process, which are usually called the invisible theme, connecting meaning and material. In this article authors try to define and complete detailed indexes of these two major major dimensions of concept of continuity through case studies. Memory has a significant role in studying place meanings. It is the function of memory, which connects time and space and results in reforming the straight time axis to a curved line through placing meanings. This is why here, authors choose qualitative method and studied lived experiences of people. Therefore, next part explains the approach and methodology of the article. Overall approach here in the study of meaning is phenomenological semiotics. The techniques used in gathering data is qualitative interview around lived experiences of people and the techniques in analyzing data is interpretative phenomenology. Finally, considering the goal of this paper, which is a modification of criteria for continuity of place meaning, results were discussed. Results explained that stability of relations between different components of place seems to be more important than the stability of components themselves. Moreover, detailed analysis of interviews and implicated meanings revealed that the relation between space and human was more regarded. The focused indexes of this relation were vitality and content richness of activities. بابک معین، مرتضی. 1394. معنا به مثابه تجربه زیسته؛ گذر از نشانه‌شناسی کلاسیک به نشانه شناسی با رویکرد پدیدارشناسی. تهران: انتشارات سخن. راپاپورت، آموس. 1391. معنی محیط ساخته شده- رویکردی در ارتباط غیرکلامی. ت : حبیب، ‌فرح. تهران : انتشارات پردازش و برنامه‌ریزی شهری تهران. شعیری، حمیدرضا، و آریانا،‌ دینا. 1390. چگونگی تداوم معنا در چهل نامه کوتاه به همسرم از نادر ابراهیمی. فصلنامه علمی-پژوهشی نقد ادبی، (14) : 185-161. شولتز، کریستین نوربرگ. 1382. معماری، معنا و مکان. 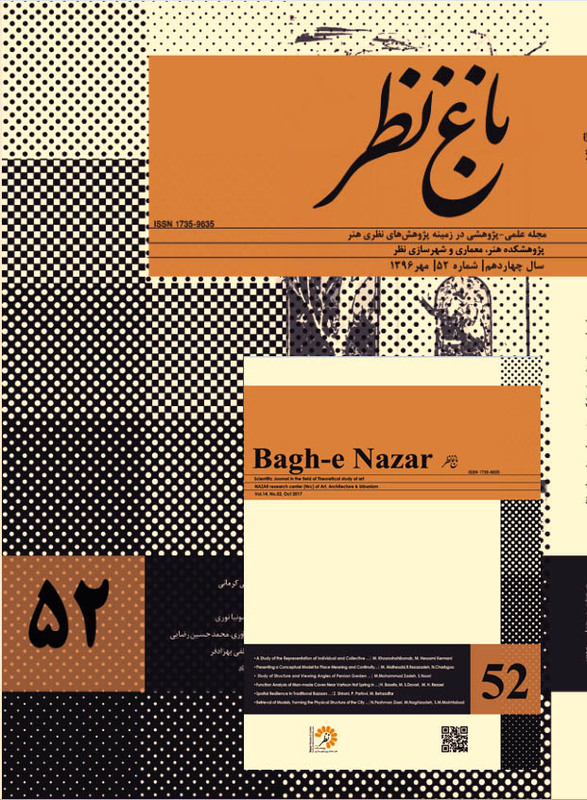 ت : ویدا نوروزبرازجانی. تهران: نشر جان جهان. ظهور، علیرضا و حسن کریمی. 1382. اطلاعات در مطالعات کیفی. فصلنامه اصول بهداشت روانی، (19-20) :113-107. علی‌الحسابی، مهران و چربگو، نصیبه. 1394. بازخوانی و تبیین ارتباط معنی و هویت مکان. معماری و شهرسازی ایران، (9):103. فکوهی، ناصر. 1383. انسان شناسی شهری. تهران : نشر نی. کارمونا، متیو، تیم هیت و تنراکواستیون تیسدل. 1386. مکان‌های عمومی، فضاهای شهری : ابعاد گوناگون طراحی شهری. ت : قرائی، فریبا و همکاران. تهران : دانشگاه هنر. لینچ،کوین. 1372. سیمای شهر. ت : منوچهر مزینی. تهران : انتشارات دانشگاه تهران. محمدپور، احمد. 1392. روش تحقیق کیفی ضد روش (منطق و طرح در روش شناسی کیفی). تهران : جامعه شناسان. نقره‌کار، عبدالحمید، حمزه نژاد، مهدی و فروزنده،‌ آیسان. 1388. راز جاودانگی آثار معماری. باغ نظر، 6 (12) : 43-31. Barkley, J. (2008). Making sense of place according to lived experience. Connecting Decision-making with Sense of Place Workshop. Illinois : Department of Recreation, Sport and Tourism, University of Illinois. Barkley, James, R.& Kruger, L. (2013). Place meanings as lived experience. In Place-based conservation: perspective from social sciences, by Stewart, P., et al. Dordrecht: Springer. Canter, D. (1997). The facets of place. In Advances in Environment, Behavior and Design, Vol. 4: Towards the Integration of Theory, Methods, Research, and Utilization, by GT Moore and RW Marans. New York: Permium press. Chandler, Daneil. (2007). Semiotics the basics. London: Routledge. Casey, E. (2004). Public memory in place and time. In Phillips, K; Public Memory. Alabama : University of Alabama Press. Castells, M. (2010). Power of Identity, second edition. Oxford: Wiley-Blackwell publication. Cresswell, T. (2009). Place. In International Encyclopedia of Human Geography, by K Rob and T Nigel. Oxford: Elsevier. Creswell, J.W. (1998). Research design: Qualitative, quantitative, and mixed methods approaches. Thousand Oaks: Sage. Eco, E. (1968). Function and sign : semiotics in architecture. In city and the sign : An Introduction to Urban Semiotics, in M Gottdiener. A Lagopoulos. New York: Columbia University press. Gibson, J. (1950). The perception of the visual world. Boston: Houghton Mifflin. Gustafson, P. (2000). Meaning of Place; everyday Experience and Theoretical conceptualizations. Juornal of Environmental Psychology, (21): 5-16. Hall, D. G. (1998). Continuity and the Persistence of Objects: When the Whole is greater than the sum of the parts. COGNITIVE PSYCHOLOGY, (37): 28–59. Lefebvere, H. (2004). Rhythmanalysis; space, time and everyday life. London: Continuum. Martsin, M. (2012). On mind, mediation and meaning-making. Culture & Psychology, 18 (3): 425–440. Patton, M. (2002). Qualitative Research & Evaluation Methods. London: Sage. Relph, . (1976). Placeand Placelessness. London: Pion. Seamon, D. & Gill, H. (2014). Qualitative Approaches to Environment-Behavior Research: Understanding Environmental and Place Experiences, Meanings, and Actions, chapter 6 in Research Methods in Environment-Behavior Research. Gifford, R. (ed). New York: Wiley/Blackwell. Trigg, D. (2014). Monuments of memory. In The Memory of Place, Trigg, D. Ohio: Ohio University Press.